Most Australians went to bed on Saturday night having already heard of the devastating earthquake and avalanche in Nepal. We woke up to learn of the growing numbers of people killed, injured or left homeless. The images from Nepal were heart wrenching to see. 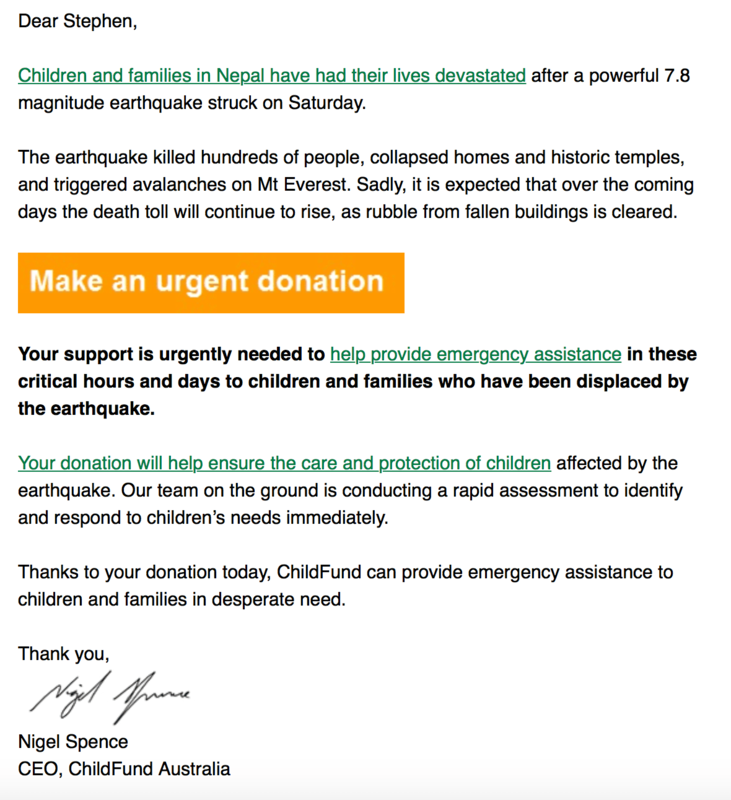 Because the Nepal Earthquake disaster happened over the weekend, the staff of most international aid charities was away from the office. Nonetheless, Childfund Australia, worked to get an appeal out on Sunday morning. I suspect more would have matched this pace had the disaster occurred on a weekday. How do charities like Childfund Australia get an appeal out so quickly? I am not on the inside, but I would venture to guess they are…prepared. Prepared by having segments pre-built and ready to simply refresh. All Childfund had to do was to write some copy, match the copy to the segments and push the urgent appeal out to supporters to raise the money needed to support the people in the heart of the disaster region. One might argue the EDM is not glamorous looking; I would argue the look and feel of this email is exactly what the moment called for and demonstrates the urgency of the message and the need for money now. How ready would your organisation be if you needed to get an appeal out literally within hours? Think about whether you have the tools in place to outperform your counterparts at Childfund Australia. Some Australian organisations take weeks and, even months, to get a tax appeal ready. Change your readiness to be more like the Childfund model.